"My dear Elinor," said the Baroness, "you would save yourself all this heart-burning and a lot of gardener's bills, not to mention sparrow anxieties, simply by paying an annual subscription to the O.O.S.A." "Never heard of it," said Elinor; "what is it?" "The Occasional-Oasis Supply Association," said the Baroness; "it exists to meet cases exactly like yours, cases of backyards that are of no practical use for gardening purposes, but are required to blossom into decorative scenic backgrounds at stated intervals, when a luncheon or dinner-party is contemplated. Supposing, for instance, you have people coming to lunch at one-thirty; you just ring up the Association at about ten o'clock the same morning, and say 'lunch garden'. That is all the trouble you have to take. By twelve forty-five your yard is carpeted with a strip of velvety turf, with a hedge of lilac or red may, or whatever happens to be in season, as a background, one or two cherry trees in blossom, and clumps of heavily-flowered rhododendrons filling in the odd corners; in the foreground you have a blaze of carnations or Shirley poppies, or tiger lilies in full bloom. As soon as the lunch is over and your guests have departed the garden departs also, and all the cats in Christendom can sit in council in your yard without causing you a moment's anxiety. If you have a bishop or an antiquary or something of that sort coming to lunch you just mention the fact when you are ordering the garden, and you get an old-world pleasaunce, with clipped yew hedges and a sun-dial and hollyhocks, and perhaps a mulberry tree, and borders of sweet-williams and Canterbury bells, and an old-fashioned beehive or two tucked away in a corner. Those are the ordinary lines of supply that the Oasis Association undertakes, but by paying a few guineas a year extra you are entitled to its emergency E.O.N. service." "What on earth is an E.O.N. service?" "It's just a conventional signal to indicate special cases like the incursion of Gwenda Pottingdon. It means you've got some one coming to lunch or dinner whose garden is alleged to be 'the envy of the neighbourhood.'" "Yes," exclaimed Elinor, with some excitement, "and what happens then?" "Something that sounds like a miracle out of the Arabian Nights. 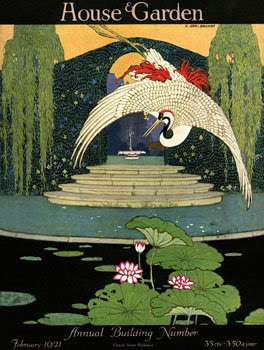 Your backyard becomes voluptuous with pomegranate and almond trees, lemon groves, and hedges of flowering cactus, dazzling banks of azaleas, marble- basined fountains, in which chestnut-and-white pond-herons step daintily amid exotic water-lilies, while golden pheasants strut about on alabaster terraces. The whole effect rather suggests the idea that Providence and Norman Wilkinson have dropped mutual jealousies and collaborated to produce a background for an open-air Russian Ballet; in point of fact, it is merely the background to your luncheon party. If there is any kick left in Gwenda Pottingdon, or whoever your E.O.N. guest of the moment may be, just mention carelessly that your climbing putella is the only one in England, since the one at Chatsworth died last winter. There isn't such a thing as a climbing putella, but Gwenda Pottingdon and her kind don't usually know one flower from another without prompting." "Quick," said Elinor, "the address of the Association." Read the entire story (it's quite short) here. illustration from the gone-but-not-forgotten 'House and Garden', c. 1921. What a fun and wonderful read at the link. Marvellous, had quite forgotten this - will have to go and dig my Saki books out now.